Question: How Do Protect Yourself If You Are In An Emergency Situation and Unable to Communicate and Contact Loved Ones? 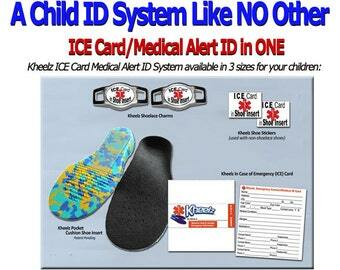 Answer: It's Simple, Carry a Kheelz Wallet or Purse ICE (In Case of Emergency Card & Medical Alert ID! 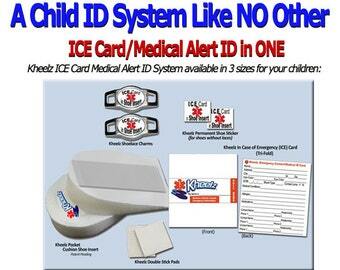 Kheelz Wallet or Purse ICE (In Case of Emergency) Card & Medical Alert ID provides you with a safe, secure, simple and very affordable way to carry an ICE (In Case of Emergency) Card and Medical Alert ID with you, wherever you go. 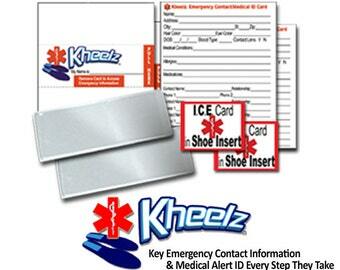 Let your Kheelz Wallet or Purse ICE (In Case of Emergency) Card speak for you when you can’t. 1) Fill out waterproof/tear proof Kheelz ICE (In Case of Emergency) Card with a ball point pen or fine point permanent marker-DO NOT USE PENCIL. 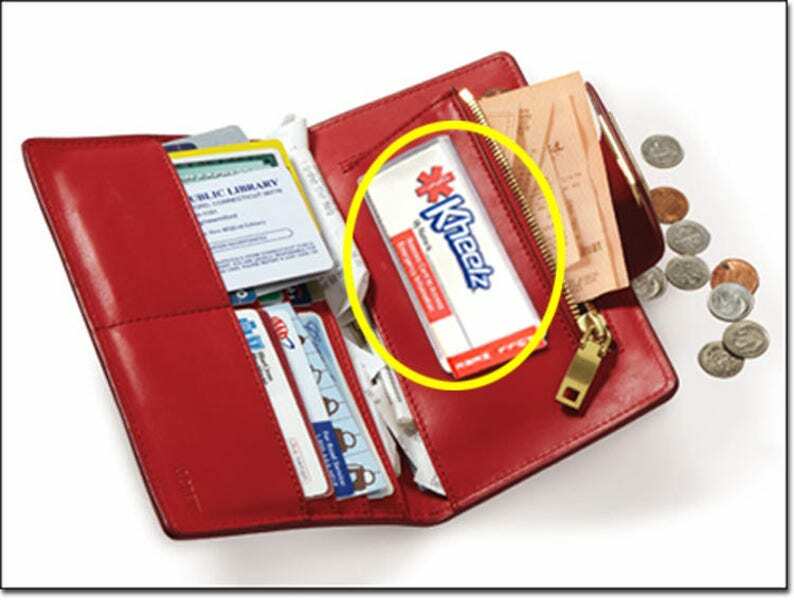 2) Tri-fold Kheelz Wallet or Purse ICE (In Case of Emergency) Card. - Clearly Visible when wallet is opened, no need to rummage through wallets slots and pictures. - Printed on special waterproof/tear proof paper. If wallet is dropped in water, simply remove Kheelz ICE Card and dry off with paper towel. - Very inexpensive way to provide yourself and loved ones with the peace of mind that comes knowing that you will be taken care of and loved ones contacted if you are in an emergency situation. Remember, cell phones break in accidents,phone batteries die, just don't rely on phone ICE contacts to be your only form of protection. If you are a caregiver, you should also wear a medical ID to alert emergency personnel of your loved one who needs attention. There are common misconceptions that by carrying an ICE (In Case of Emergency) Card & Medical Alert ID, that you are labeling yourself or bringing unwanted attention to your condition or diagnosis. 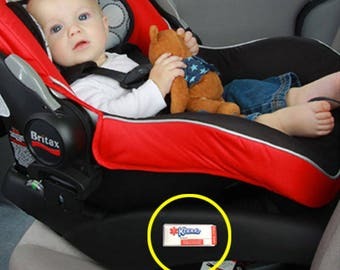 Please contact me with any questions you may have, thanks for viewing Medical Alert In Case of Emergency Wallet ICE Card Medical Alert ID Card Medical Sticker Medical Card Diabetic Food Allergy ID Card in Purse. 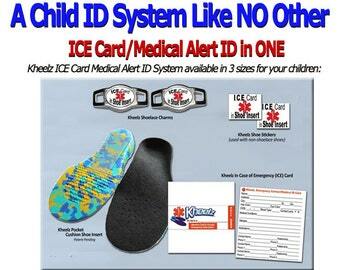 Great item to use for emergency identification. People cannot get into your cell phone for numbers, etc. if your phone is dead or has a lock. Also, a lost cell phone can be returned even if it is dead.